Sammy Lees Motors are delighted to welcome into stock this 2014 Audi Q5 2.0L TDI Quattro S Line Plus Auto with 187 BHP. Finished in the beautiful Scuba Blue Metallic which is perfectly complimented by a full Black Nappa Leather upholstery including heated front seats & 20" 5 triple spoke alloy wheels. 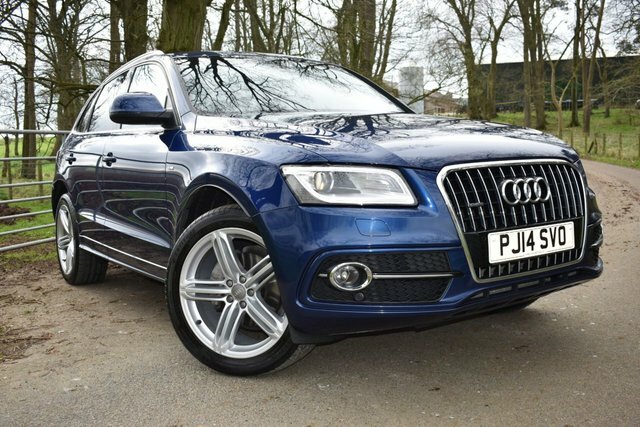 The Q5 is part of the new generation of soft-roaders hitting the UK's roads. Capable of tackling country roads, motorways & fields all in the same sitting, These vehicles are versatile & sturdy while still offering good economy & value for money. The subtle sports bodykit also helps give the Q5 extra presence & appeal on the road compared to the somewhat bland-looking standard car. This vehicle benefits from a full Audi detailed service history having been serviced at 16,939 miles on 29.6.16, 19,126 miles on 8.6.17 & will receive a full detailed service & 12 months MOT prior to customer collection as well as 1 years full FREE in house warranty - offering complete peace of mind. This immaculate & high specification vehicle comes with the following: - * Colour Satellite Navigation, * Cruise Control, * DAB Radio/CD Player, * Bluetooth Connectivity, * Leather Multi Functional Steering Wheel, * Electronic Hand Brake, * Black Cloth Headlining, * Colour Coded Parking Sensors, * Chrome Exhaust, * S Line Embossed Scuff Plates, * Automatic Headlights, * Electric Tail Gate, * Xenon Headlights, * Rear Privacy Glass, * Front Fog Lights, * Audi Handbook Pack, * ISOFIX, * 2 Remote Control Key Fobs + Much More! Buy With Complete Peace Of Mind With Sammy Lees Motors Ltd As We Are A Independent Family Run Business With Family Values Ensuring That We Provide First Class Customer Service. We Welcome Part Exchange And Are More Then Happy To Advise In Regard To The Best Possible Finance Options Available. Find Us Situated Just Off The A66 In Appleby In Westmorland - Postcode CA16 6HX. Viewing Can Be Arranged 7 Days A Week Anytime Day Or Night By Calling On 017683 53238 Or 07841 135262.